Everest Biotech are specialists in anti-peptide and antigen affinity purified goat polyclonal antibodies. They develop and manufacture high quality novel antibodies for the global biomedical research market. Their antibodies have a 100% Satisfaction Guarantee – they work in your lab or your money back. 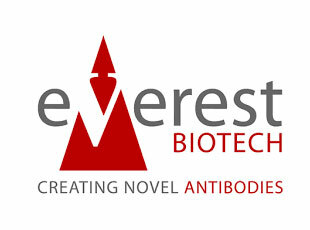 Everest Biotech’s antibodies are released either as Everest Elite Grade or Aspiring Grade products, depending on their performance in testing and the state of knowledge about the target protein. Guaranteed to work as specified on the datasheet, or your money back. Peptide ELISA data showing they recognise the immunizing peptide. Western blot data showing correct size band on physiologically relevant tissue or cell line. IHC/IF data and specific publications where available. Reward for sharing application data – submit new data to support@everestbiotech.com to receive a free antibody of your choice. Brought quickly to the market for targets that have few or no commercial antibodies available and for which there is little or no expression data in the literature. Supported by peptide ELISA data. Low background but wrong size band or no signal in the range of common cell lines and tissues available for testing. Sold at a significantly reduced price but we are not certain that they will recognize the native protein in any application. Reward for sharing data showing the antibody working successfully – submit your data to support@everestbiotech.com to receive a free antibody of your choice.